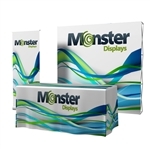 Tension Fabric Pop Up displays are a great way to combine the impact of a pop up display with the beauty of a seamless graphic back wall. They are available in curved or straight formats, and different sizes. Each booth is portable and effortless to setup. The entire display collapses into a carry bag with wheels. Optional upgrades include hard shipping cases with graphics, lights, and flooring. Try the Xpress style to create a unique display with multiple fabric pieces. Or look at the new backlighting option for a striking effect!